Ever since front-load washing machines made a comeback in the late 90's, consumers around the world have been struggling with deciding what kind of washing machine is better: the new high efficiency front-load washing machines or the traditional top-loading washing machines. Washing machines are a necessity in most households, and buyers are always looking for ways to ensure that they are getting what they pay for. Here at Designer Appliances, New Jersey & New York's premier appliance store, we know how hard it can be to find trusted guidance when selecting new appliances. This article will help you navigate between the differences in top-loading washing machines and front-loading washing machines so that you can buy the best option for you. 1) Which is easier to use? Top-loading washers are normally more convenient since you don’t have to bend over to load and unload clothes. For older buyers and those with joint issues, top-loading washers typically stand at an ideal height to save the trouble of bending down. To mitigate this issue with front loaders we recommend installing the units on laundry pedestals that raise the units about 12-15". Top loaders also have other convenient qualities, such as the ability to add clothes in mid-cycle, or even right after starting the cycle. Because the door doesn’t lock, if a sock is forgotten in the clothes basket, then it’s easy to add to a top-loading washer. Top-loading washers can also collect lint and distribute fabric softener better than front-loading washing machines can. 2) How quickly do they wash? Top-loading washers with an agitator tend to wash clothes faster than front-loading washing machines since, making them ideal for buyers who are on the go. The main reason for this is because clothes are constantly immersed in water in a top load washer. *Note that not all top loaders are same. Today, there are two main types of top-loading washing machines, one that has an agitator and one that does not. An agitator is a mechanism within a washer that creates motion by shaking and forcing water through the machine, leading to a vibrating washing machine. Top-loading washing machines with agitators typically wash quicker, but top-loading washing machines without agitators (known as high-efficiency top load washing machine) clean better, can clean more clothes at once, and use less water. As such, HE (high-efficiency) washing machines cost more. Despite being easier on your back, top-loading washers can also be rougher on clothes, especially if the machine is overloaded. Front loaders are much gentler with clothes. Top-loaders also have a difficult time washing larger items, such as pillows or comforters, as they won’t fully immerse in the water. Front-loading washers are typically more expensive, but justifiably so. Front-loading washers give a more quality clean and are more energy and water efficient than top loaders. Americans second biggest water expense comes from washing machines, and front-loading washers can cut this cost down. Even average, front-loading washing machines use 40% less water than the average top-loading washing machine, according to TXU Energy. Consumers Reports also consistently rate front-loading washers higher “excellent” and “very good” compared to top-loaders normally being rated “poor” or “fair.” Altough the upfront cost of a front loader is more, we think over the long run this total expense evens out. 5) Which uses less water? Front-loading washing machines have the ability to be stacked with a dryer, using up less space than a top-loading dryer for consumers in smaller spaces. 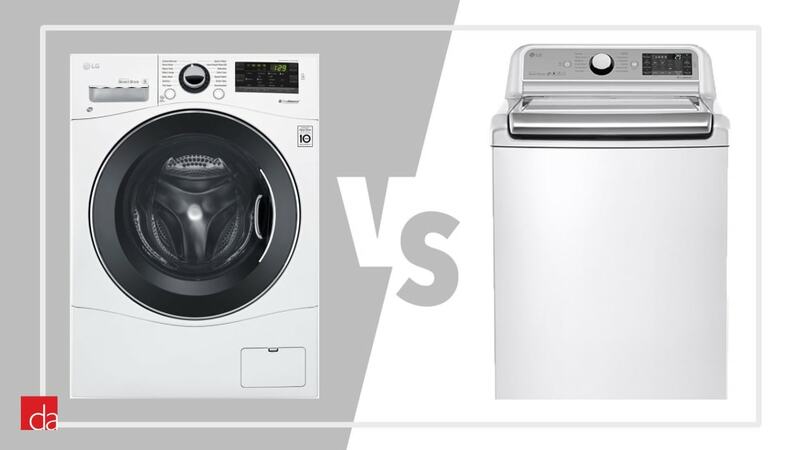 There are two popular reasons why users decide to go with a stacked washer-dryer layout. The first is that they have no other choice—many homes or rental units have their laundry sets located in small closets where vertical space is the only space available. But even those who have additional space are opting to go vertical because it allows them more functional floor space that can be used for storage or left open for a clutter-less appeal. In many homes, space, among other details, are a major deciding factor when choosing a washer and dryer. If you have limited space or an unusual set up, be sure to refer to our post on compact washers and dryers. Gone are the days when consumers and homeowners are constricted to the builder-grade laundry centers that are immovable and space-hogging. As vertically stacked arrangements have become more popular, nearly all washers and dryers being manufactured are built to have stacking compatibility. Even the largest units which might seem un-stackable are being produced with vertical stacking capability as a key feature. During the final spin cycle, front-loading washing machines generally spin about 33% faster than typical top loaders, meaning that more water will be removed from the clothes before you transfer them to the dryer. This means your clothes will dry faster in the dryer and will be less heavy to move between the two units. One drawback however is that the spin cycle causes many front-loading washers to vibrate, making noise that many people would rather avoid. One of the biggest complaints about front-loading washers is that over time mold can buildup around the door's rubber gasket. To combat this, front-loading washers require a lot more maintenance than top-loading washers. Top-loading washing machines don’t have this issue since they rely on gravity to pull water down, so water doesn’t get trapped in any seals.